In its various guises, Temple Brewing has undertaken quite the array of collaborations. They've brewed twice with Frank Peifer, head brewer at the world's oldest established brewery Weihenstephan. Last weekend they hosted a mass collaboration between the brewers affected by a failed supplier to create an Eastern Coast IPA. They've brewed with the Local Taphouse Ale Stars and also created the People's Pint in a competition we ran a few years back asking the people of Australia to come up with a beer. Their latest venture saw them head west to the Grampians and into the kitchen garden of one of Victoria's highest rated restaurants, the Royal Mail Hotel in Dunkeld. The plan is to create a series of seasonal beers with the team there that will pour at Temple and the restaurant. 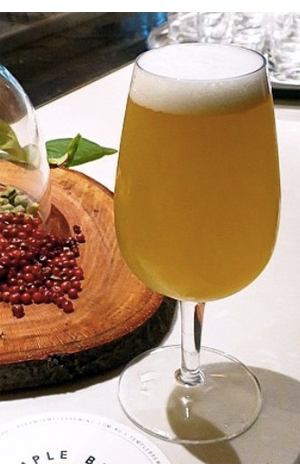 To create this first Season's Harvest, they plucked some lemon verbena (which we're linking to as we didn't have a clue what it was) and pink peppercorn which were used in a Belgian style witbier. The choice of base beer makes a lot of sense, given it's one in which spices and fruity elements dance over a simple flavour base. And so it's proved with this glowing yellow beer leaping out of the glass with lively citrus and lemon sherbet aromas that are backed up by equally zesty flavours and a touch of peppery spice. Refreshing as you could wish for, certainly a beer that will sit well on the dinner tables at the Royal Mail, and one that we'd suggest Temple should brew again when the start of next summer arrives.